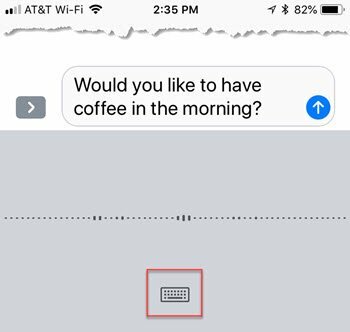 When you create text or email messages or notes, you can dictate text instead of typing it. With a little practice, you will find that you can compose long messages in now time. It is also easy and there is one simple trick to make it successful. Any place where you see a keyboard on the screen and you are tempted to type, look for the microphone next to the space bar. Tap the Microphone. See the screen on the right. Then speak. You will need to say the punctuation and format control. This is the simple tip that is not obvious on the screen See Punctuation or format below. When you are finished, tap the Keyboard icon on the bottom of the screen. Here is a list of common punctuation and instructions that you will use as your dictate.